Jacob Frank Redekop: minister, teacher, school administrator; born 23 July 1895 in the village of Petrovka, Naumenko, South Russia, to Franz B. Redekop (1857-1920) and Elisabeth (Friesen) Redekop (1858-1938). He was the ninth child of eleven siblings and three half-siblings. On 15 October 1918 he married Agnes Wiebe (28 May 1897, Nikolayevka, Ignatyevo, South Russia - 25 February 1965, Clearbrook, British Columbia, Canada), daughter of Johann P. Wiebe (1868-1956) and Aganetha (Martens) Wiebe (1873-1952). They had seven children: John (died young), Frieda, Clara, Paul, Ernest, Sophie, and John. Jacob died 23 May 1959 in Clearbrook, British Columbia. After completing elementary school in Petrovka, Jacob attended the Kommerzschule (Business College) in Barvenkovo in 1909 and 1910 where he boarded at the home of his teacher, Rev. A. H. Unruh. On 20 July 1909, at the age of 14, he was baptized by Rev. Cornelius Siemens and joined the Mennonite Brethren Church (MB) in Petrovka. After immigrating with his parents to Canada in 1913, he soon resumed his education, studying at the Mennonite Collegiate Institute in Gretna, Manitoba, in 1916-17 and later also at the Rosthern Academy in Rosthern, Saskatchewan. In 1918, J. F. Redekop began his Bible School teaching career at the Herbert Bible School, Saskatchewan. Following one year at Herbert he enrolled at Tabor College, Hillsboro, Kansas, where he graduated with a B.A. degree in 1922. J. F. Redekop then taught at Rosthern Academy until 1926. During these years he also earned a permanent teaching certificate. For the next three years he taught the upper grades at the Main Centre School, SK. During 1929-30 he taught at Bethany Bible School in Hepburn, Saskatchewan, after which he returned to teach in the Herbert Bible School until the spring of 1944. During those years he pursued further studies, earning a B.Th. from the National Bible College, Wichita, Kansas, in 1936. His wife, Agnes Redekop, labored diligently at her husband’s side. Even in times of economic difficulty she hosted many visitors. Although very busy in running the household, often without her husband, as time and funds permitted, she accompanied him in his travels. Ordained to the ministry in 1933 at Main Centre by Rev. H. W. Lohrenz of Hillsboro, Redekop preached in many churches and at many conferences across Canada and the USA. He particularly enjoyed the many "deeper life" conferences he conducted but also undertook extensive evangelistic work. While teaching, preaching and farming, he also served the larger church in various capacities, including secretary of the Saskatchewan Home Missions Committee (1930-43), chairman of the South Saskatchewan District Conference (1939-43), assistant chairman of the Canadian Conference of Mennonite Brethren Churches (1941-43), and moderator of the British Columbia Conference. From 1944 until his untimely death in 1959, Jacob taught at the Mennonite Brethren Bible Institute in Abbotsford, now Columbia Bible College. He served as principal from 1946 until 1955. When the Abbotsford M.B. Church, now Central Heights, was established in 1950, as a daughter church of the South Abbotsford MB Church, Jacob was elected as assistant pastor, a position he held until his death. 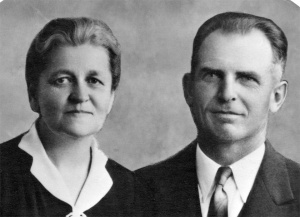 While still enjoying a far-reaching ministry, preaching in English, German, and Russian, Redekop passed away suddenly of a coronary occlusion on 23 May 1959 in Clearbrook, BC. Redekop, John H. "Redekop, Jacob F. (1895-1959)." Global Anabaptist Mennonite Encyclopedia Online. December 2004. Web. 24 Apr 2019. http://gameo.org/index.php?title=Redekop,_Jacob_F._(1895-1959)&oldid=123515. Redekop, John H. (December 2004). Redekop, Jacob F. (1895-1959). Global Anabaptist Mennonite Encyclopedia Online. Retrieved 24 April 2019, from http://gameo.org/index.php?title=Redekop,_Jacob_F._(1895-1959)&oldid=123515.